The principle of the local deposition process which is induced with a focussed electron beam (in short, FEBIP): molecules from a gas-injection system are deposited on the sample surface in a reversible manner. The focussed electron beam dissociates adsorbed gas molecules. The resulting non-volatile compounds remain permanently on the sample. Electron microscopes use focussed electron beams to make extremely small objects visible. By combining the instrument with a gas-injection system material samples can be manipulated and surface structures measuring only nanometres across can be "written". 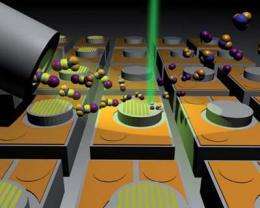 Swiss researchers at EMPA, together with scientists from EPFL, used this method to improve lasers. The vertical cavity surface emitting laser (VCSEL) is a semiconductor laser which is often used in data transmission for short-distance links like Gigabit Ethernet. These lasers are very popular in telecommunications because they consume little energy and can be simply fabricated in volumes of many tens of thousands on a single wafer. However, these VCSELs can exhibit one weakness: Because of the cylindrical structure in which the lasers are built up on the wafer, the polarisation of the emitted light can sometimes change during operation. Polarisation is a property of certain waves, such as light waves, and it describes the direction of oscillation. A stable polarisation is necessary in order to reduce transmission errors and to use VCSELs in future silicon photonics. The team led by Empa researcher Ivo Utke, together with scientists from the Laboratory of Physics of Nanostructures at EPFL, could provide assistance by using a method called FEBIP (focussed electron beam induced processing). Weve written flat grating structures on the VCSELs with an electron beam, says Utke in describing their solution, and the gratings were effective in stabilising the polarisation. The study has recently been published in the scientific journal Nanoscale as an advanced online publication. 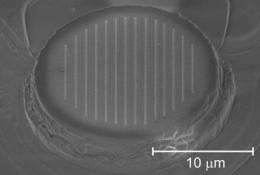 The result is a nanostructure - for example a polarisation grating on a VCSEL (vertical cavity surface emitting laser). These are semiconductor lasers frequently used in optical data transmission.